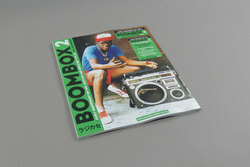 VA / Soul Jazz Records Presents - BOOMBOX 2: Early Independent Hip Hop, Electro And Disco Rap 1979-83. Vinyl LP, CD. Bleep. Soul Jazz gift us with the second volume of their Boombox series, a thorough-as-hell look into the post-Rappers Delight craze that took the streets of the New York ghettos by storm. Almost all released on tiny independent labels, the singles span sample heavy funk inspired rap tracks through to amateur throwbacks about high school glory days. Every piece is thoroughly of its era, full of hype bravado and simple rhymes mixed with big basslines and loud toms, but for any fan of the genre this is an incredibly in-depth document of the early days of hip-hop.